FOOTBALL: MARK Robins hopes Max Biamou’s strike against Swindon Town on Saturday can spur the Frenchman to further success this season. Biamou recorded his first league goal for the Sky Blues when beating Reice Charles-Cook for speed 17 minutes into the first half. A brace for Marc McNulty secured victory for Coventry on a day where the late Cyrille Regis was remembered by all in attendance. 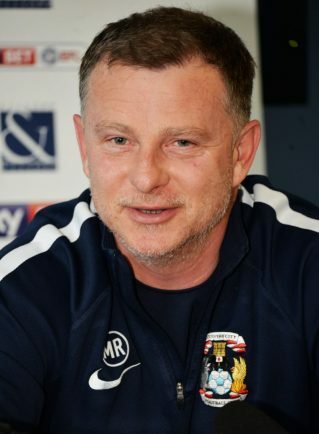 A pleased Mark Robins said: “That was a terrific performance. “There were some good goals and the lads were throwing themselves on the line, which was great to see. “Today was a really moving day. Biamou’s goal was met by great celebration from Sky Blue supporters, and Robins believes the strike can inspire Biamou to further success. He said: “It felt like Biamou was possessed with Cyrille today. “The goal he scored was top-drawer. Hopefully that gives Max a surge of confidence that he can build on. “We were ruthelss with our chances today. Swindon are a really potent attacking threat. To deal with them the way we did was fine. “I never felt like we were under any real pressure apart from a ten minute spell after we were two goals up. “Then they ended up with a goal which was dissapointing because our defence got swapped and we dealt with everything before that. “Lee Burge made a couple of great saves.